There’s a youth movement going on in Minnesota. After selecting Connecticut forward Napheesa Collier sixth overall in the 2019 WNBA draft, the Minnesota Lynx got busy. The Lynx, who owned three picks in the second round and another in the third, selected Notre Dame forward Jessica Shepard with the 16th overall pick. Minnesota then drafted Marquette guard Natisha Hiedeman (18th overall) and Buffalo’s Cierra Dillard (20th). But the Lynx immediately traded Hiedeman to the Connecticut Sun in exchange for Lexie Brown, a guard entering her second season in the WNBA. Minnesota wrapped up the draft by selecting former Gophers guard Kenisha Bell with the 30th overall pick. Brown, the ninth overall pick by Connecticut in 2018, played 22 games for the Sun last season and averaged 1.7 points in 5.6 minutes per contest. Back in college, Brown was the first player in NCAA history to see AP third team All-American honors at two different schools – Duke (2017-18) and Maryland (2014-15). Shepard, one of five Notre Dame players to be selected in Wednesday’s draft, logged 16.7 points and 10.3 rebounds per game during her senior season. She tallied 11 points and 10 rebounds in Notre Dame’s 82-81 loss to Baylor in the national title game Sunday. Shepard was a key piece of the Fighting Irish team that won the NCAA tournament in 2018. Dillard brings her 3-point shot to the Lynx, as she nailed 105 3s in 34 games for Buffalo during her senior campaign. Dillard led Buffalo with 25.2 points and 5.7 assists per game. 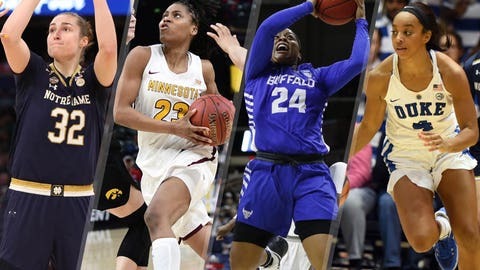 Bell, who transferred to Minnesota after her freshman year at Marquette, is the fourth Gophers player to be selected by the Lynx and the eighth player in program history to be drafted into the WNBA. She averaged 19.1 points and 5.9 rebounds per game during her senior campaign, the first season under new Gophers head coach Lindsay Whalen.